A lush, verdant streamside planting. The Garden has a low annual rainfall, generally unsuitable for the cultivation of thirsty marginal plants, and we are lucky to have a small flowing stream feeding the lake, which allows us to grow moisture-loving plants. All the plants grown here at the waterside have been selected to thrive in these damper conditions. 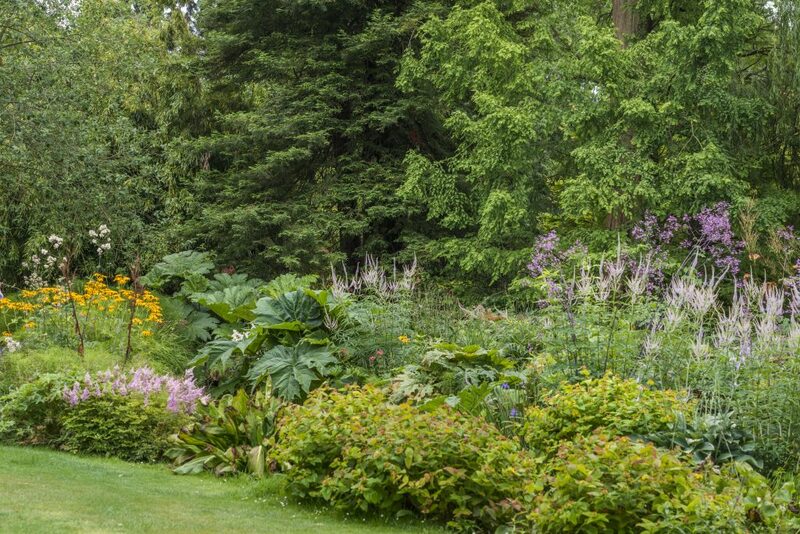 Exotic looking species such as the giant rhubarb, Gunnera manicata, and the skunk cabbage, Lysichiton americanum, jostle for attention with Cirsium rivulare ‘Atropurpureum’, Veronicastrum virginicum and Dicentra spectabilis ‘Alba’. 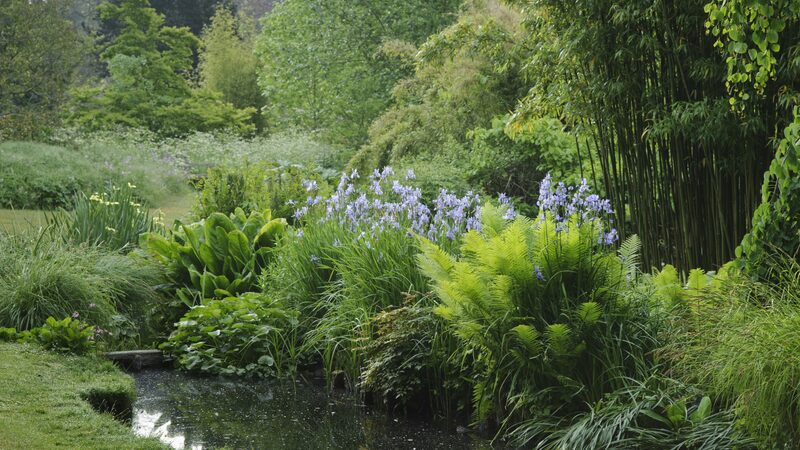 Heading towards the lake and the bog garden, the planting becomes more naturalistic with the great horsetail, Equisetum telmateia, piercing the ground in spring to produce brittle stems with whorls of fine, feathery foliage. 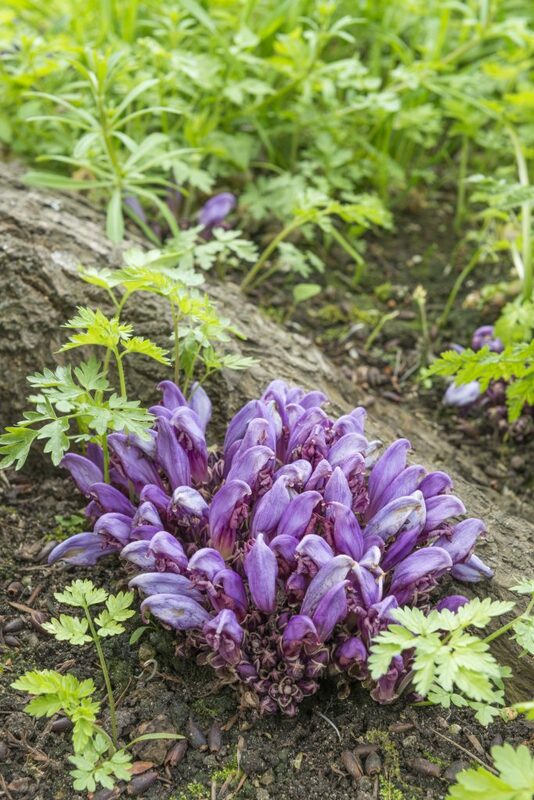 Throughout can be spotted the purple hoods of the distinctive toothwort, Lathraea clandestina. The stream is fed from Hobson’s Conduit, which runs along the western boundary of the Garden, and was built in 1610 to supply fresh water to the city centre. The water we withdraw from the Conduit provides a constantly flowing supply of fresh water, which not only benefits the adjacent plantings, but which also provides a valuable habitat for wildlife.